The Screaming Eagles were first established as VF-1 on the 1st of February 1943, became VF-5 on the 15th of July 1943, changed to VF- 5A on the 15th November 1946 and finally became VF-51 on the 16th of August 1948, retaining that designation until the squadron's disestablishment in March 1995. For much of the 1970's the squadron flew F-4N Phantom II's and were involved in the final stages of the Vietnam War, flying from the USS Coral Sea. 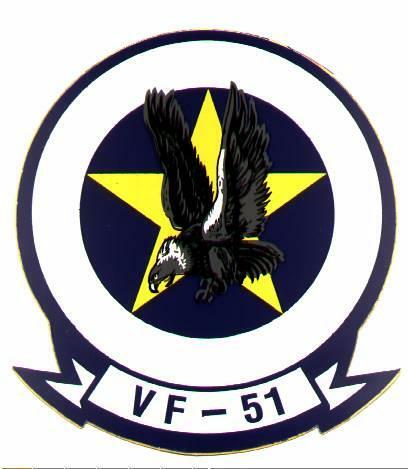 Members of VF-51 were amongst the first groups of POW's to be returned by the North Vietnamese. After flying with the F-4 for so long VF-51 started to move to the Tomcat in June 1978, receiving it's first F-14A on the 16th of this month. In a little under a year VF-51 deployed on it's first cruise with the F-14A, coming aboard the USS Kitty Hawk (CV-63) in May of 1979. The squadron was part of CVW-15 at this time, partnered by VF-111 also flying the F-14A. After two more cruises on Kitty Hawk the air wing moved to the East Coast for a short while, conducting the first operations from the newly introduced USS Carl Vinson (CVN-70) in March 1983. After the initial ops onboard Vinson the carrier and air wing deployed on a round the world cruise from March to October 1983. Since then the USS Vinson has been the standard carrier for CVW-15 deployments. Among VF-51's 'firsts' is it's claim to be the first US Navy squadron to land the F-14A automatically in both day and night conditions. Another of the squadron's claims to fame is that they were the first to intercept Soviet Tu-26 Backfire bombers, armed MiG-23 Floggers and Su-15 Flagons using the Tomcat's TCS (Television Camera Sight). The TCS is one of the F-14's most useful sensors, allowing the crew to passively identify a target to determine whether it is hostile or not. This was put to good use in the 1989 air combat off the Libyan coast. In 1985 VF-51 was one of several Miramar based squadrons who took part in the filming of 'Top Gun', the hit film starring Tom Cruise (and it's real star, the F-14A Tomcat). I am able to confirm that some VF-111 aircraft were repainted in fictitious squadron markings for the film, but whether any VF-51 aircraft were repainted I do not know. To enable filming of these impressive sequences the F-14's were fitted with cameras mounted in pods attached to the underbelly Phoenix pallets and the underwing pylons, as well as using ground mounted cameras. The 1987/88 cruise onboard USS Carl Vinson saw VF-51 conduct operations in the Bering Sea during winter, one of the most difficult and testing environments in the world. The next deployment began on the 1st of February 1990, this time CVW-15 and the USS Vinson conducted operations in the Western Pacific and Indian Ocean. This cruise saw VF-51 and VF-111 in several exercises with regional air forces, including those of Singapore, Malaysia and Thailand. They also took part in ACM exercises with VC-5 and participated in 'Team Spirit 90', a battle group evaluation exercise. The carrier and air wing returned to port on the 29th of July. Original Navy plans saw VF-51 and VF-111 becoming the first deployable squadrons to transition to the F-14D Super tomcat, however these plans were cancelled in December 1991 and VF-51 spent the time to it's disestablishment (in March 1995) flying the F-14A. The first type of markings used by VF-51 featured gloss black tails (apart from the forward edge, left grey as the area featured dielectric panels) with the 'NL' tailcode in black, outlined in white. Three horizontal red lines ran across the middle of the tail and were repeated on the inside of each tail. The under engine strakes were black, edged in red with 'VF-51' in white. Sometime before October 1982 the CAG bird had its red tail stripes replaced with a stripes of red, green, orange, blue and yellow, these being repeated on the inner surface of the tail. For at least one cruise a variation of these markings appearred with the red replced by a spectrum of colours, I believe each representing a different squadron in the air wing. An image of this scheme is shown below. VF-51's colourful markings lasted a very long time, still being in evidence in 1985, but eventually the pressure of low-vis caused a change. The gloss black was removed from the tails and the markings became black, rather than multi-coloured. Even this was later toned down, the black being replaced by dark grey. By the 1990's the 'NL' code had been replaced by an eagle and shifted to the upper portion of the tail, reducing in size.